Pd-alloy membrane for hydrogen separation – Techverse Inc.
High temperature-high pressure (HTHP) separation of hydrogen with CO2 capture from coal (coal-biomass) derived syngas is a key enabling technology for efficient utilization of the abundant coal and biomass resources in an environmentally clean manner. Palladium-alloy based membranes offer excellent H2/CO2 separation ability with high hydrogen flux rate as well as selectivity at HTHP conditions. 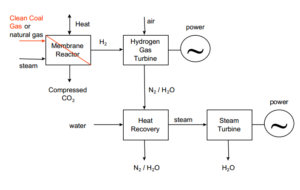 Techverse, Inc. has successfully demonstrated utilization of a ternary Pd-alloy membrane for hydrogen production in a bench-scale integrated water gas shift (WGS) membrane reactor process suitable for coal derived synthesis gas environment.